Popular lotteries like Powerball and Lotto can make your dream come true. Many great stories can be told of people who never though they would become a millionaire, including the Massachusetts hospital worker who recently won the Jackpot of 758 million dollars! Obviously the people behind the lottery and the lucky winner herself still can’t believe it. This jackpot was the second largest Jackpot in USA history! 758 million is one of the highest lottery tickets in the United States that has led to a win. Sometimes the name of the winner isn’t known, but in this case it is. A woman named Mavis Wancyzk of Chicopee, a place near Boston, never has to worry about her finances again! She reacted with surprise and said that the first thing she wanted to do was ‘hiding in her bed’. She has been a hard worker at the Mercy Medical Center in Springfield for more than three decades. It comes as no surprise that she has quit her job. You can become a Powerball player in almost every American state, from Puerto Rico to Washington D.C, the Virgin Islands and 44 other states. Powerball is a very popular lottery because you can win with all sorts of combinations. In total there are 292,201,338 possible combinations, which makes the odds of winning 1:292,201,338,00. The overall winning odds of winning any prize are 1:24.87. Although the winning odds aren’t very high, stories like those of Mavis show that everything is possible. Mavis couldn’t believe her eyes when she saw her numbers appearing during the draw. The numbers were 6, 7, 16, 16, 23 and 26 with ‘4’ as the Powerball. Luckily she was in the companionship of a co-worker because the woman was in such a shock that she almost couldn’t drive home. The co-worker followed her with his/her car, so that nothing would happen. The big win is finally sinking in, Wancyzk says. She’s figuring out what to do with the money. She has decided to take a lump sump of an astonishing 480 million dollars. Obviously the big win gained a lot of media attention. The new millionaire purchased the ticket at a Pride market in her hometown. Other sources said that the winning ticket was actually sold in Boston. There was some confusion, but eventually it came out that Mavis visited the store in Chicopee to purchase the ticket. Whatever it might be, every time that the store sells a 1 million winning ticket it will receive 10.000 dollars. So in total the store will receive 50.000 dollars. According to the owner, who calls the lottery win ‘amazing’, 50.000 dollars will be donated to local charities. 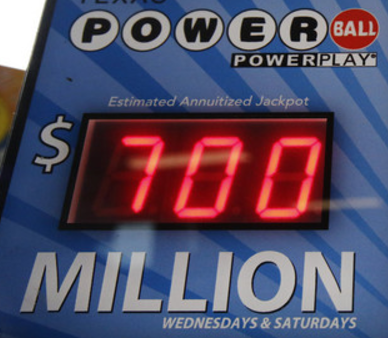 Interestingly enough, the prize wasn’t even the largest payout in Powerball history. In 2016 three winners had to share an unbelievable 1.58 billion dollars! However, Mavis is the only winner of 758 million dollars this time. It makes clear that it’s definitely worth it to buy a Powerball ticket. Six other people each won 2 million and 34 people won 1 million. According to lottery officials, 9,397,723 tickets in total were responsible for a total win of 135 million dollars. Powerball definitely has a good year, because earlier this year there were already two Jackpot hits of 435 million dollars (in February) and 48 million dollars (in June). Impressive!